Visionary director Wes Anderson’s 'Isle of Dogs' tells the story of Atari Kobayashi, 12-year-old ward to corrupt Mayor Kobayashi. When all the canine pets of Megasaki City are exiled to vast Trash Island, Atari sets off in search of his bodyguard dog, Spots. With the assistance of his newfound mongrel friends, he begins an epic journey that will decide the fate and future of the entire Prefecture. The film features an all-star cast voicing the dog and human characters including Bill Murray, Scarlett Johansson, Edward Norton, Jeff Goldblum, Bryan Cranston, Greta Gerwig, Bob Balaban, Tilda Swinton, Live Schreiber, Frances McDormand, F. Murray Abraham, Courtney B. Vance and Yoko Ono. The 'Isle of Dogs' competition has now closed. Winners will be announced shortly. Competition opens at 5pm AEST on Sunday 15th July 2018 and closes at 11:59pm AEST on Sunday 22nd July 2018. Five winners will be chosen at random on Monday 23rd July 2018. To successfully win, entrants must fulfil the above entry conditions before the time the competition closes. Current members/followers are eligible to enter the competition. Only one entry per person. Only one winner per household. To be a valid winner, the entrant must not have won a prize from SWITCH within the last 28 days. Each winner will receive one Blu-ray copy of 'Isle of Dogs'. By entering, you agree to receive occasional emails from SWITCH in the future. If you decide to unsubscribe from these updates, any further entries will not be applicable. Only Australian residents are eligible to enter. 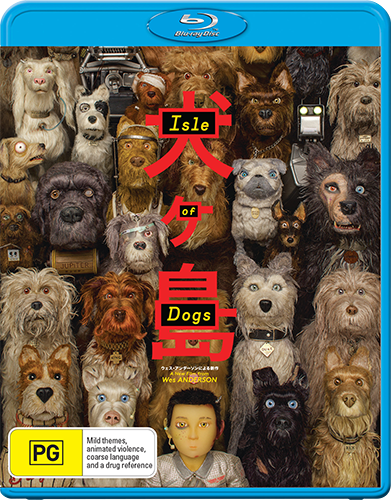 'Isle of Dogs' is available on Blu-ray, Digital and DVD on Wednesday the 18th July 2018 from Twentieth Century Fox Home Entertainment.